The Google vacuum has sucked up a colossal hairball known as Motorola, which will go down as one of the company’s largest acquisitions in history. Moto-freaking-rola. Yes, the pioneer of some of the most innovative technologies since its founding as Galvin Manufacturing Corporation in 1928, including the two-way radio, pager, and world’s first commercial portable cell phone, the DynaTAC, now lies in Google’s hands. At least Moto’s smartphone business. If you use a two-way radio on a daily basis, you should be fine, unless Google swoops in and gobbles up the rest of the company tomorrow. At this rate, Google will own NASA by next year. 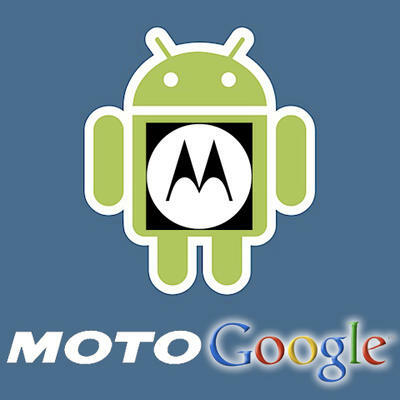 According to decoded jargon from Google CEO Larry Page, the monumental business transaction was fueled by patents–oodles of them on Motorola’s part. From a legal perspective, this bolsters Google’s abilities to stave off Apple’s and Microsoft’s raging lawsuits. It’s survival, and part of Google’s thirst for power. They want to be number one, despite what I’m hearing from the company regarding the fact that they will keep Motorola a separate company and license Android to it, just as they have done with HTC, Samsung, and the rest. This, my friends, is the honeymoon phase of the relationship. Google will appear to be the dashing, thoughtful suitor in the beginning, expressing its care for the other phone manufacturers, and letting Motorola wear its varsity jacket. However, I believe Google has far more sinister plans by acting as the Blob and eating Motorola. Eventually, consumers will lust after a complete Google phone from hardware to software to build quality. Google will obviously funnel every ounce of engineering and OS tweaking into its very own Motogoogle phones, which will be optimized to run the latest and greatest versions of Android. In fact, Google may stop supporting other manufacturers like HTC and Samsung now that they own one of the largest hardware companies in the phone world. Talk about the potential for an extreme monarchy. And where are the contracts? I’d like to see a contract that states Google will continue to support other manufacturers. Think of the tidal wave of power Google now has. If they want to be the only makers of Android phones, they sure as hell can make that happen by pulling the rug out from under the “little guys.” Although HTC, Samsung, and the rest of the gang have been in the spotlight supporting this transaction, I can guarantee they are sweating processor chips from within the rotisserie-like confines of the mobile sauna Google has placed them in. 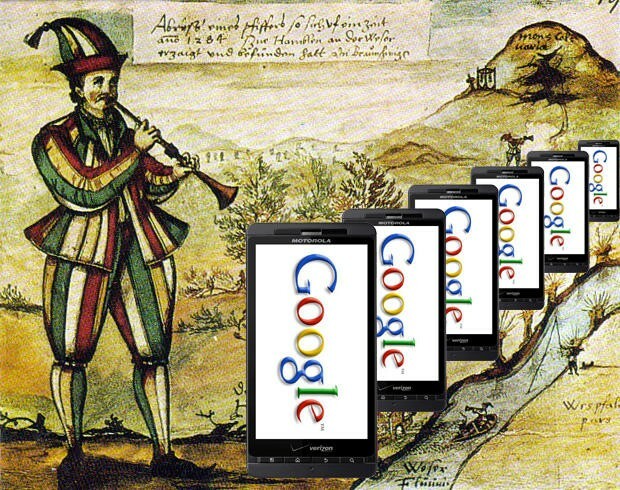 Besides, Google has already procured the magic pipe from Motorola, acting as the new Pied Piper for millions of customers that will fall like candy into their hands. For, what does a software company know about hardware? We all remember the Nexus One debacle and how Google had to knock on Samsung’s door late at night for a secret rendezvous that led to the Nexus S, essentially cheating on HTC before breaking up. Google is not the cute, cuddly bear everyone deems it to be. Slurping up Motorola was as strategic as you can get. Motorola is one of the top guns in the hardware industry, and they just happen to own a million-acre farm of patents that Google salivated over like a rabid tasmanian devil. The likelihood of proprietary operating systems from HTC, Samsung, and the rest is grim, though these companies may be forced to retaliate in the future without support from Android. Maybe a third party will step in for the rest of the smartphone world. Let Apple, Microsoft, and Google duke it out while some genius no-name developer cranks out the OS to end all OSes for the little guys. Hey, there’s also webOS … that no one seems to care about except for Noah. We still love you, Noah. And QNX on the rise, which I am beyond jazzed about. But this is big. Google is a snowball, and it will consume until it is the biggest snowball on the mountain. And even then, it will consume the mountain, and the sea, and the continents, and the Earth, and eventually the Solar System. That is, unless the cyborg revolution will put an end to us all in the next century. Maybe I’m wrong. Maybe Google will adhere to its proclamations. But I have to take everything with a boulder-sized grain of salt when it comes to the Tech world. What do you say, readers? Are there any fellow cynics in the building?